You can tell I'm in Valentine's mode by the color schemes I've been gravitating towards lately. There's something about hot pink and orange and yellow that I love. I tried it out on this Cascading Hearts background stamp by Sunny Studios and I'm in love! To create the card, use the Cascading Heart stamp and a trio of pigment inks ranging from fire engine red to bubblegum pink to orange. Using a stamping platform is key to getting the coverage shown here. Next, stamp a trio of kitties and balloons from the Purrfect Birthday stamp set and color with Copic markers. Use foam tape to pop up the center kitty and some of the balloons. 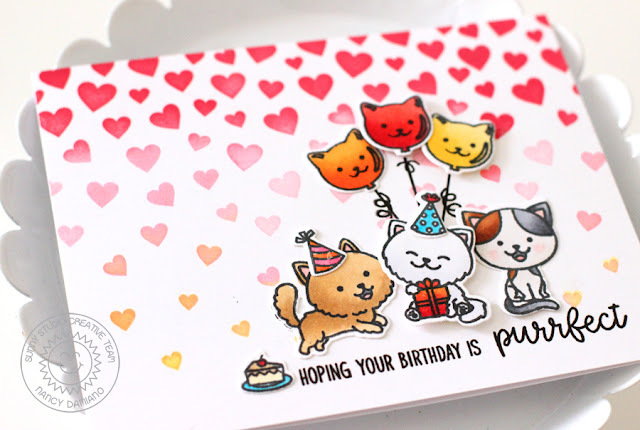 Add the sentiment just under the kitties in blank ink. Place a small cake icon at the start of the sentiment for a bit of whimsy. 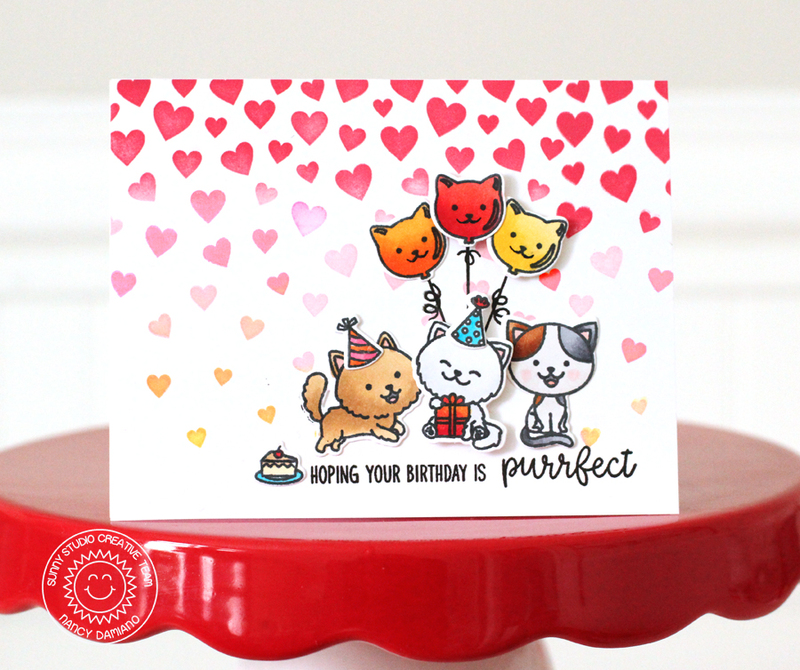 Use the Cascading Hearts stamp to create a beautiful shower of love for all of your stamped images! 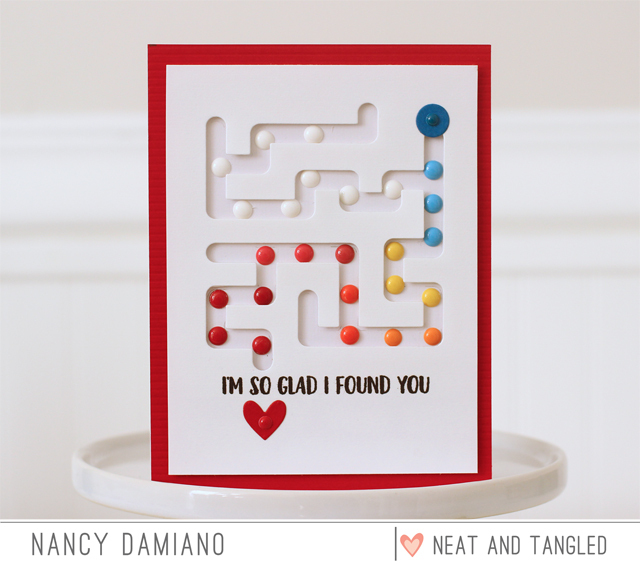 Hey there, welcome to the final day of the January Neat and Tangled release. The last set up is the Koalification stamp and die. Who doesn't love a big-eared koala? This little guy makes for the cutest Valentine's Day cards. To create this card I started with a white base with two die cut hearts. The openings were filled with shades of pink cardstock to give them a sunburst effect. The cute koala was watercolored with Distress Inks in Frayed Burlap and Gathered Twigs. The matching sentiment was stamped in the ribbon with black ink and a handful of sequins were placed to add a bit of sparkle! 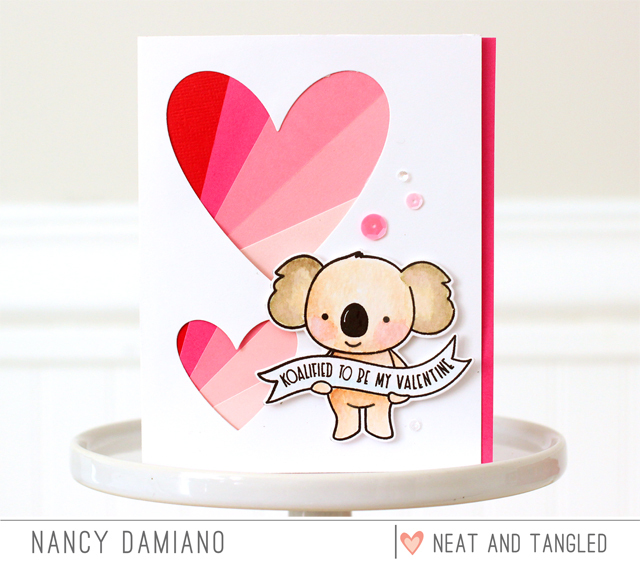 Neat and Tangled will be giving away a Koalification Stamp Set. To enter, leave a comment below to be entered. Be sure to visit the Neat and Tangled blog on Friday for a list of winners. Good luck and thanks for stopping by! Hey there, welcome to the day two of the January Neat and Tangled release. The next set up is the Hexagon Steel die and stencil. I love intricate geometric backgrounds that this design provides. It makes for the best backgrounds! 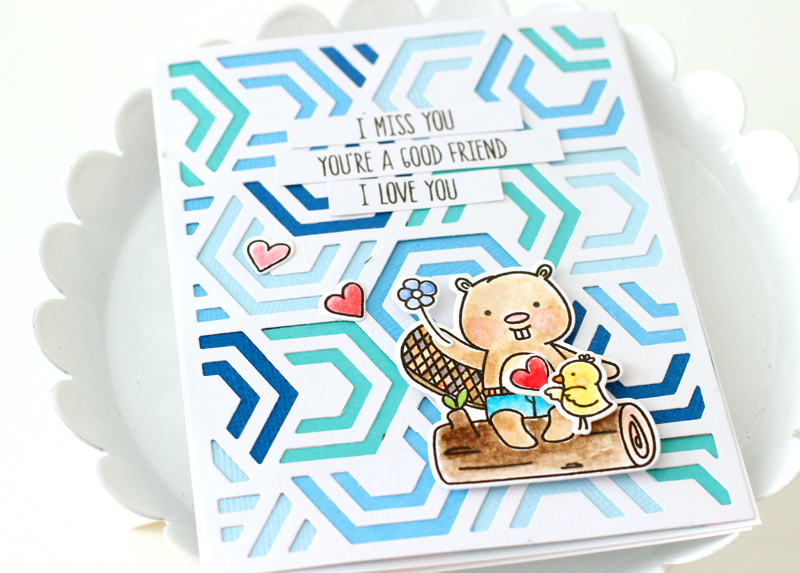 To create this card I started with a white base and the Hexagon Steel Die. To add a splash of color, cardstock in shades of blue were added to the background. The stamped images were colored with Distress Oxide Inks and popped up with foam tape. All of the sentiments from the set were stacked in the center of the card - I couldn't decide which one I liked best! 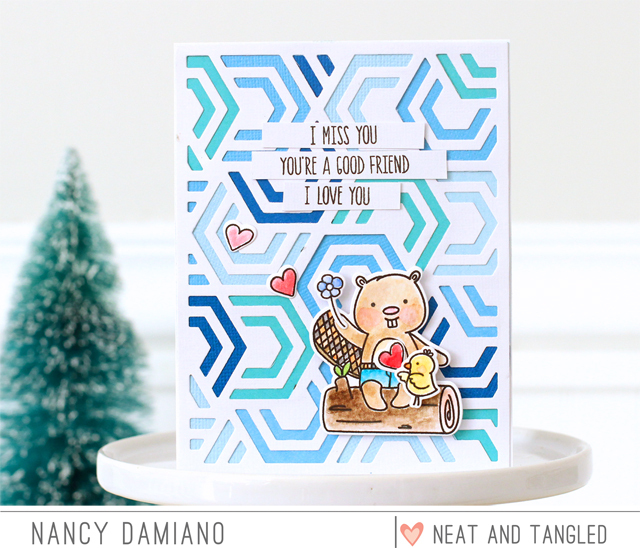 Neat and Tangled will be giving away a Hexagon Steel Die set. To enter, leave a comment below to be entered. Be sure to visit the Neat and Tangled blog on Friday for a list of winners. Good luck and thanks for stopping by! Hey there, welcome to the day two of the January Neat and Tangled release. The next stamp set up is Beaver Eh! and it's my favorite from this release. The critters have a spark of cute and are really fun to color. To create this card I started with a white base and three strips of cardstock in light salmon, hot pink and golden yellow. This gives the background a splash of color. The rectangle inner base was stamped at the bottom randomly with gray ink. The falling text adds interest to the base. The stamped images were colored with Zig Clean Color Markers and popped up with foam tape. Neat and Tangled will be giving away Beavers Eh! stamp set. To enter, leave a comment below to be entered. Be sure to visit the Neat and Tangled blog on Friday for a list of winners. Good luck and thanks for stopping by! I'm "celebrating" the season with a look at a mix of wintery friends from the Polar Playmates and Playful Polar Bear stamp sets. Who am I kidding, is so not my favorite time of the year. On the upside though - this is my creative season. So I've decided to just go with it and create a wintery scene using some Sunny Studio Stamps. To create this card, begin with a strip of medium blue and darker blue adhered to the bottom of the card. 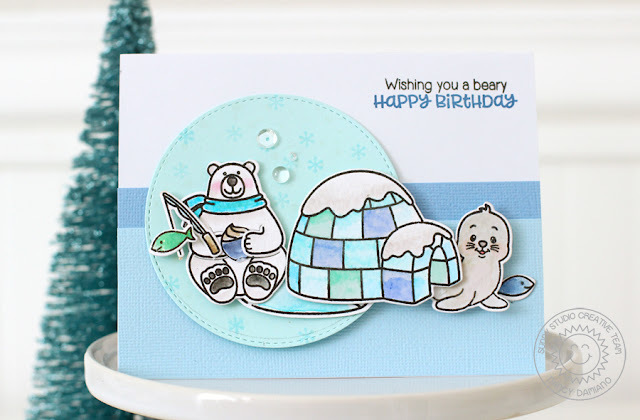 A circle die cut of aqua cardstock was stamped with the Snow Flurries stamp to give it some movement and tie it into the theme. All of the whimsical images were watercolored with Zig Clean Color makers for a bright punch of color. They were adhered with pop dots for some added dimension. A few dew drops and the sentiment stamped in black and blue inks complete this card. And that's it! Creating a snowy is scene is like therapy for this winter avoiding chick. At the very least - it's cute and I really love that. Hey there, welcome to the day two of the January Neat and Tangled release. The first stamp set up is A-mazing! and it absolutely is. I especially love the coordinating steel die that finds it's way from here to there. 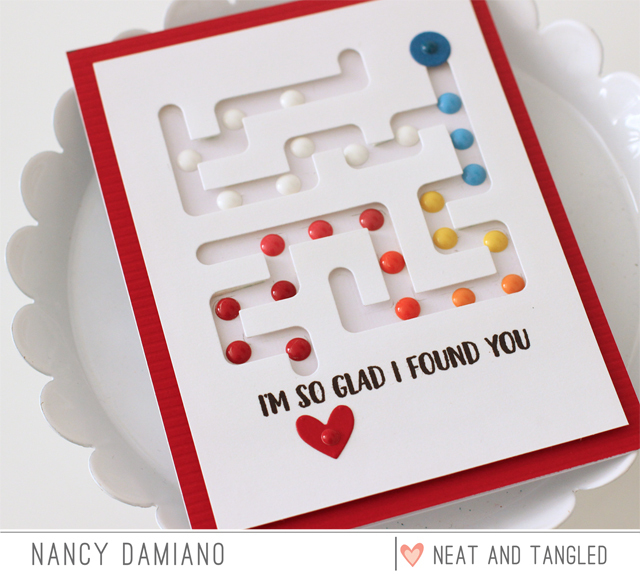 To create this card I started with a white base and the A-mazing steel die. I traced the maze onto a second sheet of white cardstock to use as a guide for the enamel dots. The dots were used to create a path from "me" to "you" (the heart). The sentiment was stamped on the die cut front and adhered to the white backing with foam tape to give it dimension. Neat and Tangled will be giving away an A-mazing stamp set. To enter, leave a comment below to be entered. Tell me what you are most looking forward to this New Year to enter! Be sure to visit the Neat and Tangled blog on Friday for a list of winners. Good luck and thanks for stopping by!